This opulent still-life scene typical of the Baroque Flemish school includes a human figure and two animals, as was common in the period, in accordance with the tastes of the clients, whose wealth and prosperity was also reflected in this genre of paintings. Snyders´ clientele were members of the nobility and haute bourgeoisie who were interested in his paintings as testimonies to wealth as well as for their artistic qualities. Arranged on a table, probably in a kitchen, are a variety of fruits in dishes and ceramic and metal bowls; others are scattered on the table, along with a few vegetables. 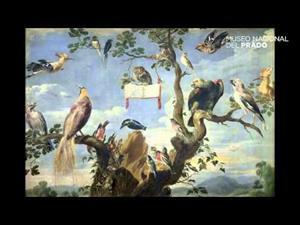 In the upper part of the painting at the end of the diagonal axis a macaw pecks at an apricot hanging from a branch that juts out from a laden basket and, on the same side, practically at the edge of the canvas, a monkey sniffs a carnation, clasping a porcelain bowl precariously balanced on two pumpkins. Behind the table a fairly sumptuously dressed young woman (note the ruff collar, the lace coif and the elegant costume with sleeves also adorned with fine lace) holding a bowl of figs in her left hand skilfully counterbalances the composition on the opposite side and tilts her face, concerned by the macaw´s mischievous play. This splendid array of country produce and its arrangement in various receptacles is one of the artist´s most polished achievements and the subject matter, from both the aesthetic and descriptive viewpoint, is a pretext for a lavish display of detail, masterfully rendered, with appropriate illumination achieving an effect of tactile qualities with superb results. According to Diaz Padrón, judging by the style, which is clearly influenced by Rubens´ works, the painting may be dated to between 1610 and 1620. His opinion is contradicted by Robels, who believes it to be a later work, perhaps from the early 1630s. In the 1636 inventory of the Alcazar palace this painting is recorded as hanging in the king´s resting room (large room before His Majesty´s bedchamber which is where he dines in the lower summer quarters. Crawford-Volk 1981, appendix II, p. 526). This inventory also refers to it as a gift from the Marquis of Leganes to Philip IV. However, the painting cannot have belonged to him for very long as there is no record of it in the first inventory of the aristocrat´s collection in 1630. As for likely interpretations of the motifs found in the work, it is reasonable to think that the bowl of figs held by the woman may possibly be a reference to marital love and fertility. The macaw pecking at the stalk could be the bird of love, but also maternity (it may be originally derived from Marian symbology). The carnation sniffed by the monkey can be interpreted here as a symbol of fertility and marriage (compare I. Bergstrom, Den symboliks nejlikan, Malmö 1958). Prince Paul Galitzin owned an etched reproduction by G. Creux. The composition is similar, though different in content, to that of the painting on canvas entitled Fish Stall (Ottawa, National Gallery of Canada). The model of the woman is also repeated in the Brussels version (Musees Royaux des Beaux-Arts). 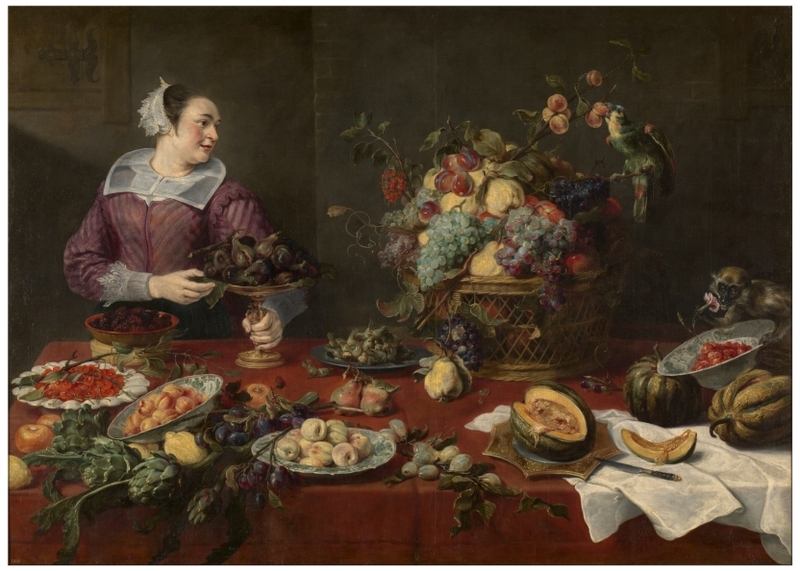 The success enjoyed by Snyders´ still lifes from the second decade of the 17th century onwards may be related to the expectations of economic recovery arising from the signing of the Twelve-Year Truce in 1609 between the Spanish Netherlands governed by the archduke and archduchess and the United Provinces of the north. In a letter to his physician and friend Johann Faber, written in April 1609, Rubens states that our country will again flourish during this period. This was a widespread opinion that subsequent history did not prove wrong (Text drawn from Luna, J. J.: From Titian to Goya. Great Masters of the Museo del Prado, National Art Museum of China-Shanghai Museum, 2007, pp. 371-372). Height: 153 cm. ; Width: 214 cm. Collection of the First Marquis of Leganés, gift to Felipe IV; Royal Collection (Royal Alcázar Palace, Madrid, 1636, "pieza grande antes del dormitorio de S.M. ", and 1638; Royal Palace of El Buen Retiro, Madrid, "sala de conversación", 1772, no. 641; Royal Palace, Madrid, "cuarto del príncipe-cámara", 1814-1818? ).